The fans of Carolee's first book, Herbal Beginnings, have been begging to know what happens to Callie and Joyful Heart Herb Farm. 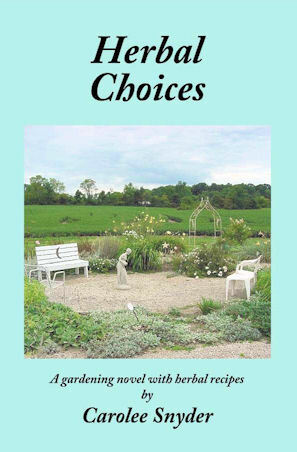 Herbal Choices is the result, chronicling Callie's second year on the farm, with lots of choices to make for her business, her employees, and her life. It's another tale of romance and mystery, interwoven with lots of gardening information and herbal lore. And, the choice continues for readers, who can choose for their second course from over 70 original recipes for a choice of soups or salad! If you would like the book inscribed to a specific person, please add a note indicating to whom the book should be autographed.